I received an e-mail from Charlie Peterson this morning. Charlie's the author of Wood Flooring: A Complete Guide to Layout, Installation & Finishing from Taunton Press. He thanked me for reviewing his book and then he went on to tell me that the 330 pages of the book as it stands was whittled down from the 5200 pages he'd written originally. That's quite an editing job and I'm sure a lot of his ideas, tips and pointers were left on the cutting room floor. Charlie asked me if I thought there were any way to make his book more useful. I'm flattered to asked that by someone of his stature and skill and even though most of you haven't read his book, I'm going to turn around redirect his question to you guys. In more general terms of course. He'll see this post and so now let's play a game of focus group. If you're reading this blog that means you're interested in home design or construction in some capacity. As such, you're a target for books like Charlie's wood floor guide. So when you're poking around in a bookstore, what do you look for in a design, architecture or construction book? Is it more important to be a coffee table book? You know, one brimming with beautiful photos of what's possible and little else? Or do you look for something more practical and text heavy? Is it possible to be both? Is it worth it to try to be both? How do you like you how-to information? Is it more important to inspire or is it better to instruct? In the meantime, I'm still reeling from the floor in the photo above. 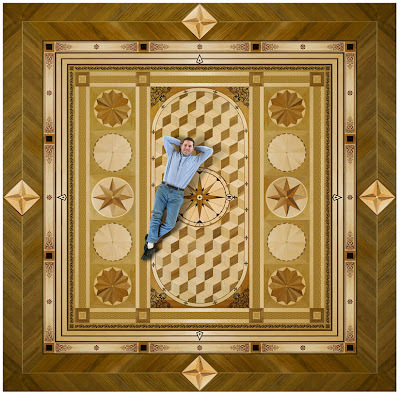 I cannot believe that it's a wood floor that he made. That's some skill. First, Charlie, congrats on your publication. In my experience and opinion, Taunton Press does an outstanding job of catching the eye with compelling imagery but what sets their products apart is content. The complete package. I often review their periodicals and am also a big fan of the Sarah Susanka "Not So Big" series. 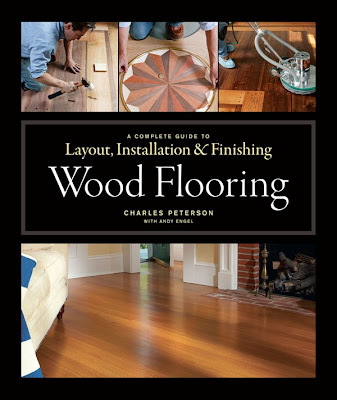 I haven't seen the Peterson guide to Wood Flooring yet but now that I know it's available I'll surely pick up a copy. It sets the bar pretty high, even for a Taunton book Mike. You'll like what you see. I tend to be drawn to books that have lots of beautiful inspiration pictures. In a flooring book, I'd be interested in reading information on different species of wood (where they're from, characteristics, best applications) and what woods are eco-friendly. I like how-to text combined with lots of photos and/or drawings. I'm a really visual person, and I absorb information way better by seeing as opposed to reading. 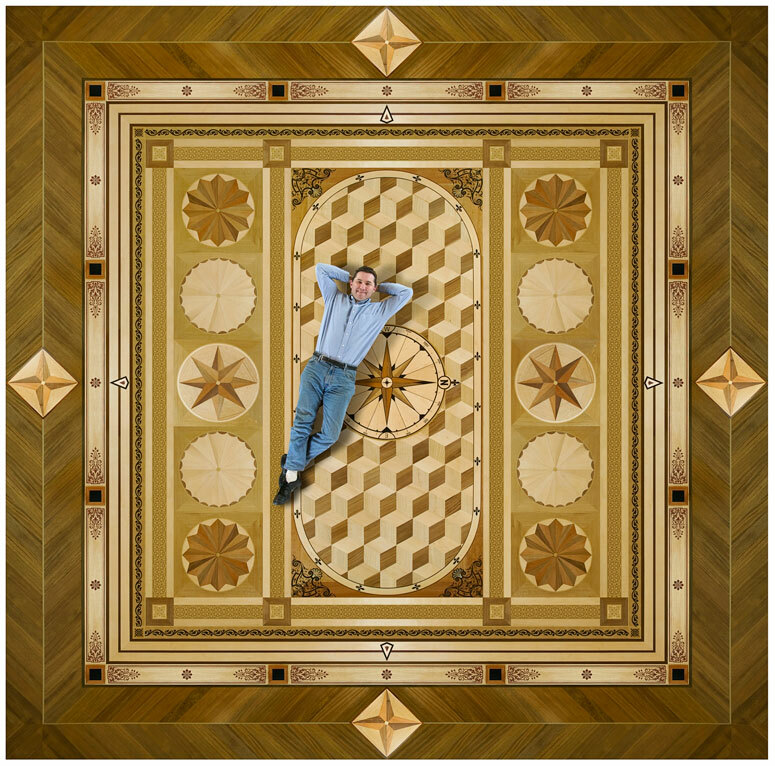 Is that entire floor made from hardwood?! Wow!! I find both types of books useful -- the coffee table books for acquiring basic design ideas, concepts, etc., and the more technical stuff to guide construction. But I'd rather not have all that stuff jammed together in one book! If the author has a lot of remaining, useful collateral, why not consider reusing it for a series of several, related books, then? What attracts me to design related books are visuals. Beautiful photographs for sure, but what I generally respond to often incents me to buy is context. I like understanding the genesis of an element, its history, how it has been used before. I love knowing what a space looked like before said element had been put in place. I love if the book has a blueprint of the space and the especially the surrounding spaces. I look for inspiration in my design book. I am not a DIYer so my eyes will glaze over at step by step instruction. I am not sure how that relates to your book, which I haven't the pleasure of seeing, but generally that what appeals to me. Eye candy never hurts but it looks like this book might be geared towards someone with a serious hobby and not a weekend DIYer...?! If that's the case leave the over-stylized pics to the HGTV crowd and cram as much of your 5000+ pages of knowledge into that book! Thanks gang, I appreciate your willingness to wade into this sight unseen. Peterson strikes a good balance between inspiration and instruction. Considering that Taunton's his publisher, that's saying a lot. He'll most definitely see your comments and if we're lucky he'll respond to some of this here. Right Charlie? What I want primarily is not a coffee table book. I want to learn the technique. That said, it's pretty effective on me to have a jaw-dropping example of a finished work, and then to go over in great detail the technique of making that particular example. That way, I have a good ideal of the scope of what can be done, and the instruction to back it up. I'll likely have my own design, but I'll want to know how to go out to the limit. Anon: It sounds like you're describing Charlie's book! Depends... For a subject like this, where I'd never attempt the work myself, an idea of what results are possible is what I'd be after (but I probably wouldn't want to buy the book; I'd borrow it). If it's for something that I might feel comptent to tackle on my own, I want all the DIY tips.